The EatSmart Precision Voyager Luggage Scale is an ultraportable and lightweight travel accessory designed with all travelers in mind, from casual vacationers to frequent flyers. Simply clip the 5.5oz luggage scale onto the handle of your suitcase or bag, then easily lift even your heaviest luggage with the proprietary two-handed SmartGrip. When complete, the travel scale will beep and instantly reveal weight on the large, blue backlit LCD screen. To weigh more than one suitcase or bag, press the ON/OFF button to reset the luggage scale and continue weighing in seconds. The Precision Voyager can weigh up to 110lbs/50kg. The two featured measurement modes - pounds and kilograms - make this digital luggage scale a great tool for traveling overseas. Thanks to its compact and durable design, the Precision Voyager can be easily stored in a suitcase or bag for your trip home. An instruction guide and CR2032 Lithium Battery are included. Note: Most airlines currently impose a strict 50lb. weight limit on bags or suitcases. Check with your individual airline before flying. 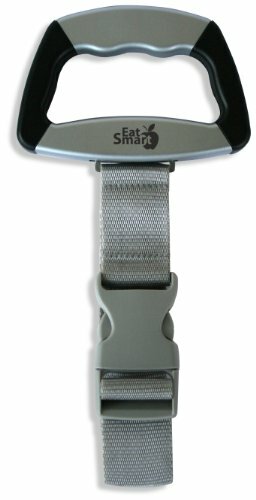 EASIER LIFTING - EatSmart's proprietary two-handed SmartGrip handle design seamlessly lifts even the heaviest luggage, providing reliably accurate weight readings up to 110 lbs/50 kg in graduation increments of 0.1 lb/0.1 kg. AVOID OVERWEIGHT BAG FEES - Most major airlines charge $100+ for overweight checked baggage. Compact and lightweight, this digital hand scale weighs luggage before you even leave for the airport and stores easily in a suitcase or bag for the trip home. INSTANT & ACCURATE READINGS - Once luggage weight has been determined, the scale will beep to instantly reveal precise, easy-to-read measurements on the large backlit LCD display. ADVANCED FEATURES - Checking more than one bag? Simply press the scale's ON/OFF button to reset and continue weighing. Built-in Auto Calibration ensures consistently accurate readings, while the 20-second Auto Off feature conserves battery life. 100% SATISFACTION GUARANTEE - Customer satisfaction is our highest priority. If this travel scale doesn't meet your standards, we'll replace it for you! A 2-year warranty and 1 CR2032 battery are included. If you have any questions about this product by EatSmart, contact us by completing and submitting the form below. If you are looking for a specif part number, please include it with your message.